A dense, mounding groundcover with tiny, needle-like leaves. Blooms from January through April with lilac-pink, bell-shaped flowers. 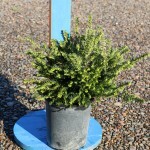 Performs best with full to part sun and evenly moist, acidic soil. Shear after flowering to maintain a tidy form. 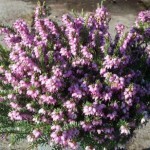 Great in mass plantings and can be combined with other Erica and Calluna for year round interest.